SB7500 has 67 stitches, 70 designs, 5 fonts, 120 frame patterns, 4x4-inch area, design editing, computer ports. Simplicity SB7500 Sewing And Embroidery Machine. Add beautiful embellishments to your runway ready looks with the new Simplicity® by Brother™ SB7500 combination sewing and embroidery machine. This powerful machine is loaded with high-end features at a simply affordable price. Jazz up your wardrobe with 70 built-in embroidery designs and 100 designs on an included CD. You also have access to over 5,000 embroidery designs at iBroidery.com. Enjoy the easy to-use, large, back-lit LCD touch screen display. The advanced needle threading system and push button thread cutter will make embroidery fun and easy. Let your creativity explode with simply original combination sewing and embroidery machine. Large 4 inch x 4 inch embroidery area. 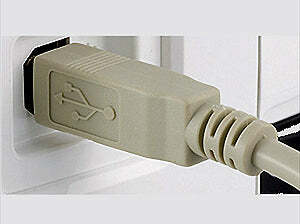 Computer connectivity for importing designs and updating your machine(USB cable included). LCD Size (Horizontal x Vertical) inches: 2.7 x 1.4. Independent Bobbin Winding Motor: Yes. Included Accessory Feet: Buttonhole foot, Overcasting foot, Monogramming foot, Zipper foot, Blind Stitch foot, Button Fitting foot, Embroidery foot. Other Included Accessories Embroidery arm, accessory bag with seam ripper, needle set, twin needle, cleaning brush, eyelet punch, screwdrivers (3), touch pen, spool caps (3), Extra Spool Pin, Scissors, Embroidery Bobbin Thread, Instruction CD, language setting sheet, felt with stabilizer, USB cable, power cord and Operation Manual. Included Embroidery Hoops: 1 (4 inches x 4 inches) Additional hoops may be available, please see Optional Accessories. Work Space (Height & Width) inches: 3.9 x 5.3. Maximum Sewing Speed (Stitches Per Minute): 710. 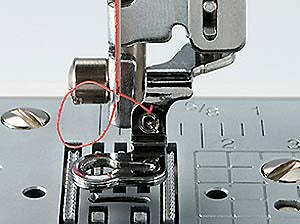 Built-in Sewing Stitches (Includes Buttonhole Styles): 67. Needle Position Key (Up/Down): Yes. Free Motion Quilting Foot: Optional (additional purchase required). Included Quilting Feet: Optional (additional purchase required). Machine Dimensions (H x W x D): 10.94 inches x 6.89 inches x 15.55 inches. Shipping Dimensions (H x W x D): 15.15 inches x 17.71 inches x 20.27 inches.